Part VII - Eliminate the Impossible: 1880-1891 features contributions by: Mark Mower, Jan Edwards, Daniel D. Victor, James Lovegrove, Gayle Lange Puhl, Thomas Fortenberry, Mike Hogan, Thomas A. Turley, Adrian Middleton, James Moffett, Hugh Ashton, Geri Schear, S. Subramanian, John Hall, Jayantika Ganguly, S.F. Bennett, Steven Philip Jones, Jim French, John Linwood Grant, Mike Chinn, Robert V. Stapleton, Charles Veley and Anna Elliott, and Shane Simmons, with a poem by Jacquelynn Bost Morris, and forewords by David Marcum, Lee Child, Rand Lee, Michael Cox, and Melissa Farnham. In 2015, The MX Book of New Sherlock Holmes Stories burst upon the scene, featuring adventures set within the correct time period, and written by many of today's leading Sherlockian authors from around the world. Those first three volumes were overwhelmingly received, and there were soon calls for additional collections. Since then, their popularity has only continued to grow, with six volumes already released, and now two more, Eliminate the Impossible, featuring tales of Holmes's encounters with seemingly impossible events – ghosts and hauntings, curses and mythical beasts, and more. In "The Sussex Vampire", Holmes tells Watson: "This agency stands flat-footed upon the ground, and there it must remain. The world is big enough for us. No ghosts need apply." 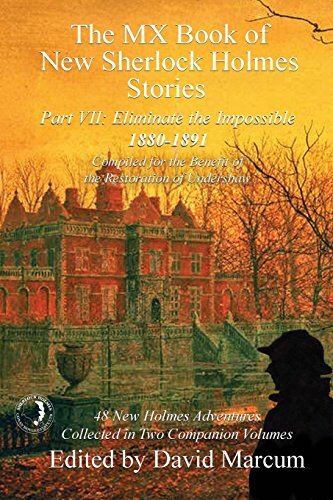 In each of the stories presented in this massive two-volume collection, Holmes approaches the varied problems with one of his favorite maxims firmly in place: "... when you have eliminated the impossible whatever remains, however improbable, must be the truth..." But what, exactly, is the truth? 2017 is the 130th anniversary of the publication of A Study in Scarlet, the first recorded adventure of Sherlock Holmes and Dr. John H. Watson. What an amazing journey it's been! In addition to the pitifully few sixty tales originally presented in The Canon, published between 1887 and 1927, there have been literally thousands of additional Holmes adventures in the form of books, short stories, radio and television episodes, movies, manuscripts, comics, and fan fiction. And yet, for those who are true friends and admirers of the Master Detective of Baker Street, where it is always 1895 (or a few decades on either side of that!) these stories are not enough. Give us more! The forty-eight stories in these two companion volumes represent some of the finest new Holmesian storytelling to be found, and honor the man described by Watson as "the best and wisest... whom I have ever known." All royalties from this collection are being donated by the writers for the benefit of the preservation of Undershaw, one of the former homes of Sir Arthur Conan Doyle.